Baja 405 Performance goes big. With full hydraulic steering from Latham Marine, the boat went precisely where our driver pointed it during various tests. To come up with the design for its new 405 Performance, Baja Marine turned to its customers and dealers for a little help. Engineers used the group's ideas when sitting down at the computer to design the largest boat in the company's lineup. 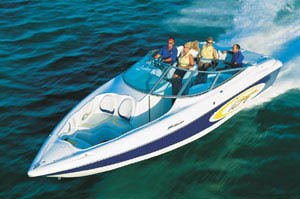 The result was a sport cruiser that was an ideal balance of comfort and performance. It offered a spacious cabin with abundant amenities and was still able to run better than 60 mph during our tests in Sarasota, Fla. Whether it's a sport-boat enthusiast seeking a larger boat or a cruiser owner looking to upgrade, the 405 Performance has a lot of appeal. At first glance, the 40-foot boat, which weighs more than 5 tons, appeared to be underpowered with two MerCruiser 496 Mag HO engines at the transom. But nothing would be further from the case as the V-bottom made the most of the 850 horsepower. 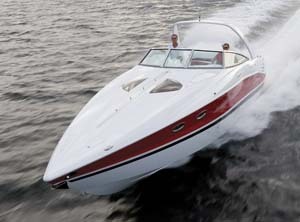 The boat got on plane in 5.7 seconds with the tabs down, and within 20 seconds it was running 55 mph on its way to a top speed of 60.3 mph. That's a strong number considering the power involved. Buyers who want to run at higher speeds might consider upgrading to 525-hp mills from Mercury Racing. 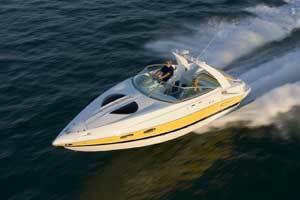 For the boat to cruise at 50 mph, the 496 Mag HO engines were turning nearly 4,300 rpm. 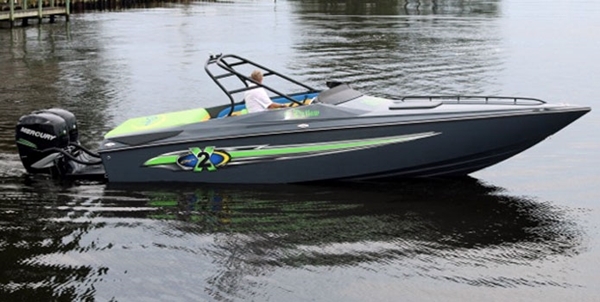 The upgrade would add significantly to the boat's $278,000 price tag, but it's worth the money if you want to spend most of your time going faster than 50 mph. 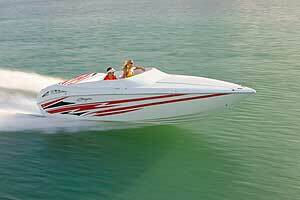 Still, with the MerCruiser engines, the sport cruiser was a ball to drive. 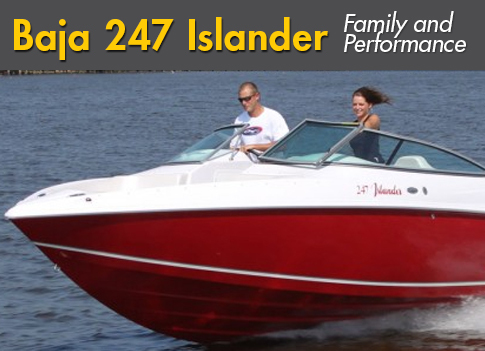 With full hydraulic steering from Latham Marine, the boat went precisely where our driver pointed it during various tests. In slalom drills, the wide-beam boat received excellent marks from our tester. In what little rough water we could find in the bay and offshore, the 405 Performance handled it with ease. The boat didn't rattle when crossing wakes and cabinet doors stayed closed-a nice touch on any boat. 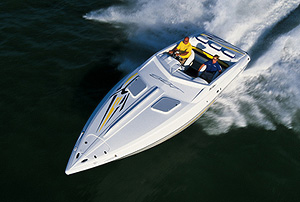 To build the 405 Performance, Baja Marine created three major components. According to the manufacturer, it builds a deck mold, which includes the cockpit floor. The second section is a grid system that consists of the engine stringers and the final section is the bottom of the hull. Those parts are then bonded together to create a boat. The boat's vibrant red, white and black colors were done in the gelcoat. A plastic rubrail with a stainless insert protected the boat's hullsides at the dock. Baja stocked the boat with six pull-up cleats-two on the bow, two at the rear and two more amidship-making it easier to tie up at the docks. Other hardware included a windlass with its own locker on the bow and large docking lights. At the rear, Baja included an impressive add-on swim platform done in nonskid with a ladder in the center that was covered by a door. The boat featured the Luxury Exterior Package upgrade, which among other things included a hot and cold shower at the transom. Access to the cockpit was via a port-side walk-through. The entire aft seat structure and padded top lifted by an electric screw jack. Our chief tester, Bob Teague, was especially impressed with the access. "There's a lot of ingenuity there," said Teague, high praise from a guy who has spent his share of time in engine compartments. The big-blocks were mounted to the stringer grid system and the finish work was far above production standards. The compartment also housed a Kohler generator for the cabin air conditioning and a water heater. 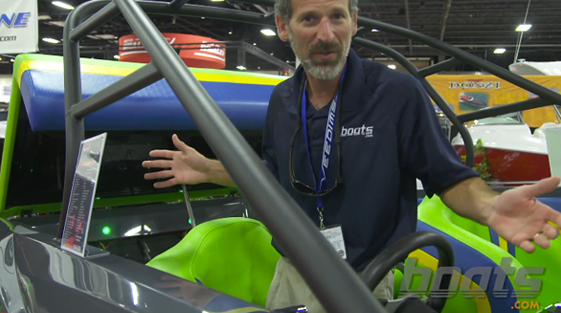 Baja eliminated the bulkhead in the cabin and that gave designers plenty of space to work with. The cabin had a European feel to it with curved cabinets and seating areas. One of the features that caught our attention was the angled, contoured lounge in the bow area. Complete with armrests and cupholders, the spot can be used to watch the Sharp flat-screen television, which was across the cabin. The large lounge doubled as a sleeping area on the 405 Performance. The seat cushions were hinged together and folded out to turn the area into a bed. On the starboard side, there were some cabinets and a countertop, and an additional lounge. The cabinets housed the stereo system, DVD player and switches for the utilities. To port was an enclosed stand-up head locker with a VacuFlush toilet, shower, vanity and sink, and cabinets. Just ahead of the compartment was a small galley that included a sink, Tappan microwave, Norco refrigerator and additional stowage. In addition to the spotlights in the cabin, Baja installed a pair of opening deck hatches and two portholes on each hullside for added light and ventilation. Out in the cockpit there was a sizable windshield to keep the wind from the driver and passengers. The center section opened to provide access to the deck. Seating accommodations included McLeod electric drop-down bolsters for the driver and observer, and an L-shape bench on the starboard side with a draining cooler under the cushion. At the helm, the boat was equipped with Livorsi II gauges above the tilting Teleflex helm. Our testers felt higher-end gauges might be a better fit with the boat's style. The throttles from Livorsi were to the right of the wheel, while the shifters were on the left. Other nice additions were a Ritchie compass, a depthfinder and a VHF radio. Behind the co-pilot's seat on the port side there was an entertainment unit with a sink, countertop and a refrigerator. The boat was also equipped with an aluminum radar arch, a $5,000 up-charge. 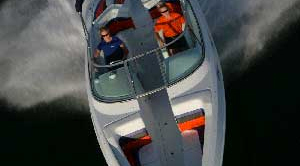 Too often when sport-boat owners move into the cruiser market they have to sacrifice performance. That's no longer the case with the 405 Performance. There's plenty of room to spread out and still comfortably cruise at 50 mph all day long. Baja listened to its customers and it's reflected in the final product.